Enjoy The Ultimate (Guilt-Free) Chocolate Experience! Now you can indulge your sweet tooth with delectable dark chocolate and savor cutting-edge science at the same time. That's because Youngevity's new Triple Treat Chocolate blends antioxidant-rich cocoa and wild-craft blueberries with probiotics, live bacteria that improve your intestinal balance of good versus bad microorganisms, boosting overall health and helping fight off disease. In other words, when the beneficial bacteria are in the lead, you win. Throw in the yummy factor of chocolate, and your taste buds win, too. "Probiotics not only aid digestion, but they also play a very important role in immunity," says registered nurse and nutrition expert Joanne Conaway, a member of Youngevity's Scientific Advisory Board. "We can go through a list of chronic infections that have everything in the world to do with not having enough healthy flora." Probiotics, by the way, are big business in the supplement industry, and consumer demand is soaring. Global sales of probiotic foods and beverages reached $15.4 billion in 2008, a 12.5 percent increase over the year before, according to market research publisher Packaged Facts. Ingredient advancements, meanwhile, have paved the way for probiotics -- once found mostly in dairy products and yogurt brands such as Activia and DanActive -- to be added to a wider variety of foods. Enter chocolate, no spoon required! "People have been able to buy probiotics in the refrigerated section, but now our industry has been able to shelf-stabilize live cultures, and nothing has been as interesting as probiotic chocolate," says Steve Wallach, Chief Executive Officer of Youngevity. 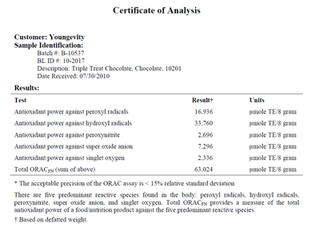 "The science shows that chocolate delivers the beneficial bacteria in a better way than yogurt." That's because traveling through the digestive tract is a tough trip. Stomach acid, digestive enzymes and bile can break down probiotics, making it virtually impossible for them to wage war with harmful bacteria. Triple Treat Chocolate, on the other hand, encapsulates Lactobacillus helveticus and Bifidobacterium longum in such a way that at least 80 percent of these beneficial bugs reach the large intestine to do their job. Studies show that this delivery method is about three times more effective than most probiotic yogurt, with a much lower caloric count and a longer shelf life to boot. If bacteria are dried and stabilized properly, they remain alive (although dormant) and start to grow again after they reach the moist environment inside your body. Triple Treat Chocolate starts out with more than 500 million live healthy bacteria per 8 grams, with an effective probiotic level being maintained, at the very least, till the end of the "best by" date on the package. Plus, you don't have to schlep to the office fridge to fetch your yogurt, which has to be eaten by the end of the week. You can keep Triple Treat Chocolate right there in your desk drawer and snack without fretting over a looming expiration date. Probiotics are defined as "live microorganisms which, when administered in adequate amounts, confer a health benefit," according to 2002 guidelines developed by the World Health Organization and the United Nations. Microorganisms (in case it's been a few years since your last science class) are tiny living organisms such as bacteria, viruses and yeasts that can be seen only under a microscope. How your body interacts with these little living things -- and how they interact with each other -- are crucial to health and well-being. According to the National Center for Complementary and Alternative Medicine, this bacterial balancing act can be thrown off in two major ways: 1.) When antibiotics wipe out friendly bacteria in the gut along with the unfriendly bugs and 2.) When disease-causing microorganisms dominate the intestines and fuel a long list of maladies, including diarrhea, irritable bowel syndrome, gum disease, urinary tract infections, respiratory problems and skin conditions. Conaway recalls when her son, now 17, developed eczema as a toddler after being treated with three rounds of antibiotics for strep throat and an ear infection. She gave him various nutritional supplements for eight years without much success, and doctors suggested steroids. The concerned mom consulted a couple of naturopathic friends and decided to try Youngevity probiotic capsules. "Within three days he began to get better," she says. "It was just mind-boggling. Not only did the eczema go away, but this kid could eat whatever he wanted, including wheat and dairy, because he was getting plenty of good bacteria in his gut." Probiotics also have shown promise in helping to lower LDL, or "bad," cholesterol. And clinical trials are in full swing on the role that healthy bacteria may play in supporting the body’s fight against a myriad of diseases. With positive scientific evidence piling up, new probiotic products are hitting the market every day. The surge is no doubt being driven, at least in part, by the fact that some 95 million Americans suffer from digestive problems. However, the exciting news is that probiotic health benefits appear to extend far beyond the belly. Add the ideal gastrointestinal delivery system of chocolate -- plus the amazing taste and antioxidant bonus -- and you can see that Youngevity's Triple Treat formula is a triumph. "It fits into the high-end chocolate market, but it's a healthy high-end chocolate," Wallach says. "We've definitely got a product that consumers are going to crave." Get The Real Skinny on Chocolate! In a recent 80-day Swedish study, volunteers who took probiotics were less than half as likely to require sick days for respiratory or gastrointestinal illness as those who were taking placebos. A study of children in day-care settings showed a similar benefit. And in another study in Japan, researchers found that participants in the probiotic group experienced a 1.4 percent drop in body weight, along with a 1.8 and 1.5 percent reduction in hip and waist circumference, respectively, over 12 weeks. No changes were observed in the placebo group. A major component of cocoa is theobromine, widely regarded as the “feel good” ingredient in chocolate. Boasting both diuretic and stimulant properties, in clinical studies, theobromine has been found to reduce food intake while fighting the common emotional drawbacks of dieting. While it shares some of the same attributes as caffeine, it doesn’t have the same “surge and crash” effect on the body. Theobromine’s effect is slower, smoother and longer lasting with only a mild influence on the central nervous system versus caffeine’s high impact. This could explain the so called “addiction” to chocolate that many people feel they have. If you eat something and it makes you feel good, then it’s natural to want more. In addition to the previously mentioned health benefits, what makes Youngevity Triple Treat Chocolate different is the “guilt-free” factor. Cocoa contains plant chemicals that are some of the most powerful antioxidant and anti-inflammatory compounds in nature. Antioxidants protect the body from aging caused by free radicals, which can cause damage that leads to heart disease. Flavonoids, meanwhile, are antioxidants that help strengthen the connective tissue of blood vessels. The darker the chocolate, the more beneficial. Plus, it's delicious. 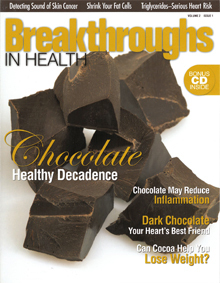 Says nutrition expert and Youngevity adviser Joanne Conaway: "Chocolate is a very pleasant way to get probiotics." -- Cocoa increases blood flow to the brain and improves cognitive function in the elderly. This may assist in treating conditions such as dementia and stroke. 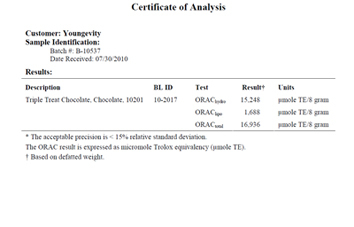 -- A chocolate compound called theobromine may help harden tooth enamel. -- Anthocyanins, a subgroup of flavonoids, help support healthy blood sugar levels which may reduce the risk of type 2 diabetes. You won't taste the blueberries in Triple Treat Chocolate, but the benefits are definitely there. A study published in the Journal of Nutritional Biochemistry found that the fat-free fruit could be linked to lower cholesterol levels and may protect against cancer and other neurodegenerative diseases. 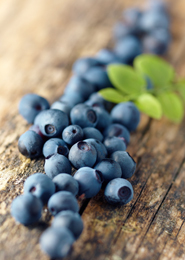 Researchers also found that people who eat wild blueberries have higher levels of a chemical that helps the tissues of blood vessel walls resist oxidative stress. -- Is an excellent source of vitamin C, which is needed for the formation of collagen and to maintain healthy gums and capillaries. -- Provides dietary fiber, which helps keeps cholesterol in check and aids digestion. -- Contains manganese, which plays an important role in the development of bones and in the metabolism of protein, carbohydrate and fat. Heart disease account for one in every three deaths of Americans annually. And while we hear plenty about new advances in surgery and medications to treat problems of the heart, far too little emphasis is placed on preventing and controlling heart disease through diet and other lifestyle measures. When you think of healthy weight loss, you probably conjure up words like appetite control, self-discipline and abstinence. These are definitely important parts of any healthy weight loss regimen. Unfortunately, some food cravings are too powerful for the average person to handle. The craving for sugar and refined carbohydrates is especially tough for some people. 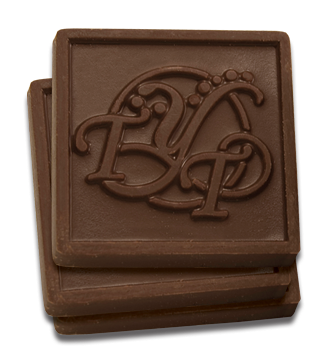 The craving for chocolate is well known as especially difficult to resist. Dr. G.N. Schrauzer and E. DeVroey M.D.